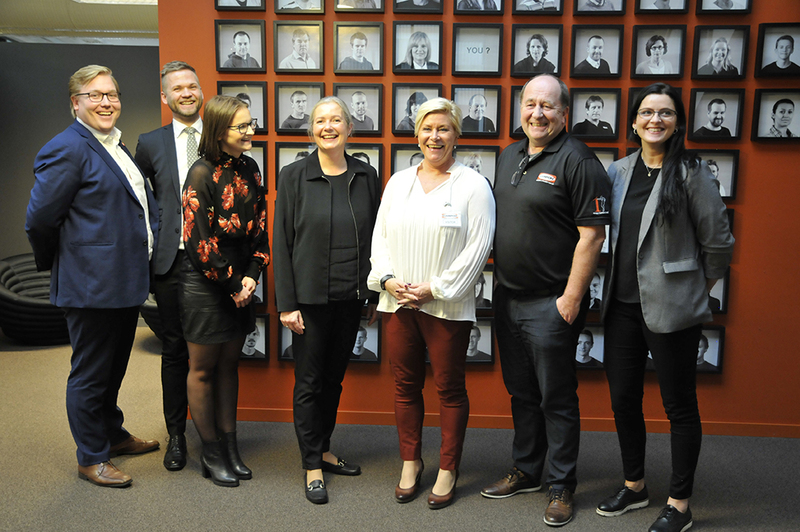 Today we had the pleasure of welcoming Siv Jensen, Norway’s Minister of Finance, to ClampOn. Following an introduction to our products, and a product demonstration, the finance minister was given a tour of the premises. Afterwards, there were good discussions about the challenges ClampOn faces as a privately owned manufacturing company in Bergen, Norway. “Receiving a visit by the Minister of Finance is a great honour for us. Being able to point out some of the things we experience as limitations to a company like us is extremely valuable” says Tonje Dahl. Dag Aldal, Anja Bilsbak and Tonje Dahl enjoyed fruitful conversations with Siv Jensen and her colleagues from the Ministry of Finance. “This meeting made my day”, says Dag Aldal, President of ClampOn “and it was great to show that we are alive and kicking”.